Google makes hundreds of adjustments to their algorithm every year and understanding the most important ranking factors can represent the difference between online success or failure. Yet how can you ascertain the most important ranking factors without the capacity to crawl and analyze millions of data points? 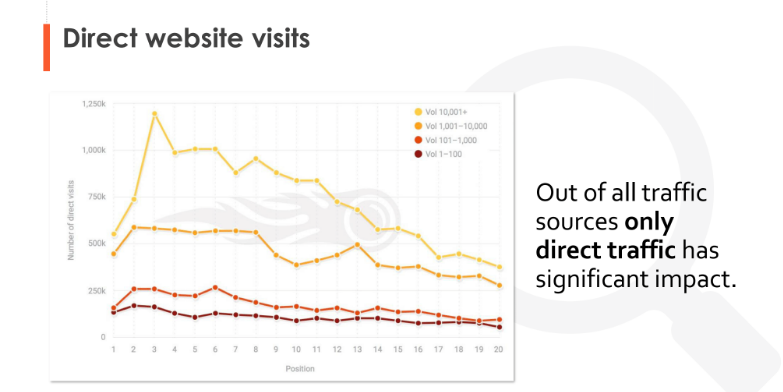 SEMrush performed this analysis, Ranking Factors 2.0, and has made the data publicly available. Analyzing and understanding this data can help you understand how to adjust your digital marketing strategy, and which changes you can implement to improve your visibility. Ready to get optimized? Here are the 7 most important ranking factors to pay attention to. Direct traffic comes from users typing in your exact website URL or accessing your site from a bookmark. Direct traffic is important, since it significantly impacts the top 10 positions on Google. In a way, direct traffic signals that users know your brand and visit your site often to find information, products, services, or to log in to a member portal. It’s an indication of trust and brand awareness by consumers. True direct traffic can be skewed a bit. 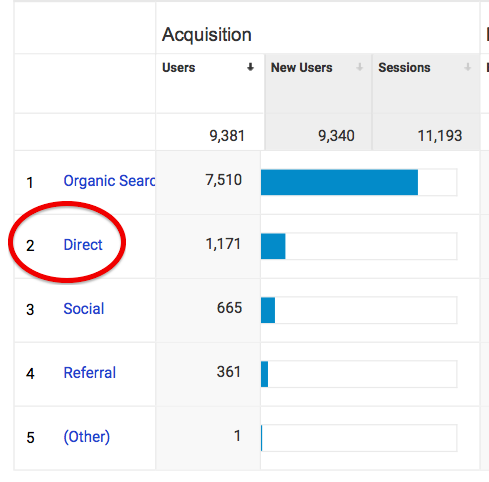 Google Analytics will report traffic as “direct” if it has no data on how a user arrived at your site (this might be via “dark social” channels, like emails). Employees accessing the website using the URL can also skew direct traffic. So exclude employee IP addresses from Google Analytics. This will give you a better understanding of your audience, and how many actual users are returning to your site. One of the best ways to increase direct traffic is to offer a powerful user experience. Users are more apt to revisit a site that is easy to navigate and answers their questions in an easily digestible way. Once the user experience is solid, you need to start campaigns to generate brand awareness. Even though branding campaigns generally have a very low return on investment, their value can be perceived when direct traffic is generated, which in turn increases organic traffic. You can use paid social channels such as Facebook, Twitter, LinkedIn, and even Quora to generate brand awareness. Your strategies should be focused on creating the most inexpensive clicks possible so that your branding campaigns don’t drain the bank but do result in new consumers learning about your brand – thus typing your site’s URL directly into the browser. Once you get your audience to visit your site, you want to keep them around for as long as possible. Time on site is another big ranking factor Google algorithms are actively analyzing, and so should you. Why is time on site important? Google wants to know that the content and information on the page is valuable to searchers. For example, if your time on site is less than 30 seconds, this signals to search engines that the content you are providing may not be fulfilling a user’s needs. This can lead to a decrease in ranking. Did you know that the average time on site is about three minutes? How does your time on site stack up against the average? If it is below two minutes, it may be best to make increasing time on site a priority. There are a few ways to increase time on site. 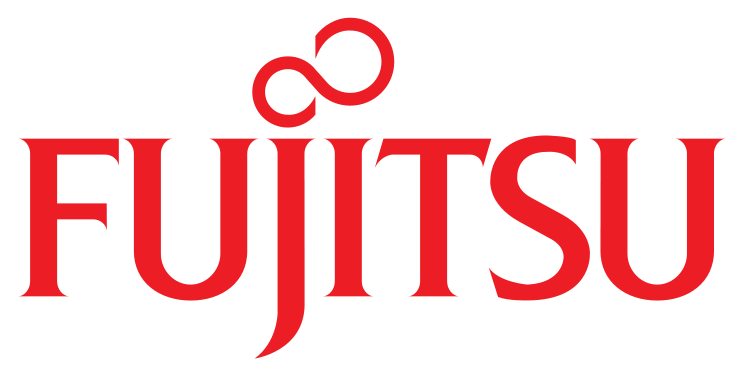 It is a delicate balance between providing easy-to-digest content while still giving a user what they are looking for. Once you have users on your page and engaged, provide easy site navigation to increase pages per session. The average pages per session signals how compelling users find your content and how easy it is to access. The average pages per session across most industries are two pages. Anything over two pages per session is good to aim for. If a user is engaged and wants to learn more or read more of your site’s content, that tells search engines that your site is useful to those who visit it. However, if your average pages per session are three, but your time on page is low and bounce rate (see next top ranking factor) is high, you may not see a jump in rankings. Increasing pages per session is about the quality of content you’re serving to users as well as your site’s navigation. You want to lead your users in a specific direction to net more pages per session. For example, let’s say a user lands on a page of a blog looking for a specific answer. 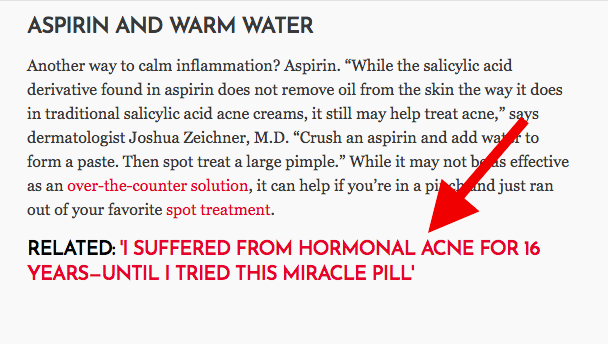 In this case let’s say it’s adult acne. 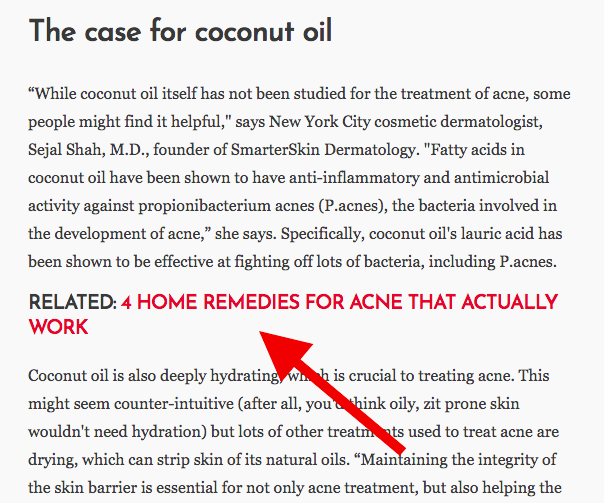 In the body of the content, users will see a related blog post for the same topic, but with different DIY remedies. This strategy leads users interested in the original topic to explore another page on the same topic. Guess what’s in the body of that content? More helpful links to more pages on the topic! You get the idea. 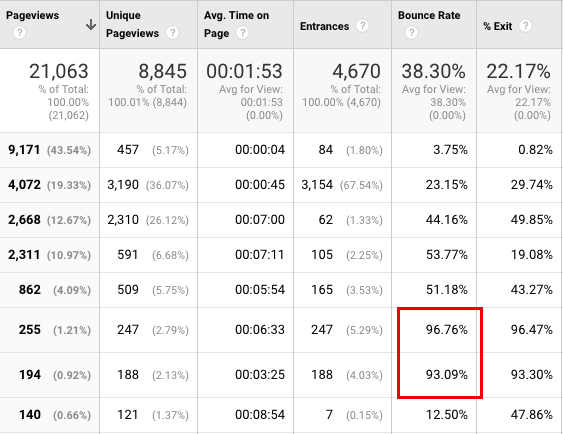 Now let’s take a look at bounce rate to round out this trifecta (time on page, pages per session, and bounce rate) for increased ranking. The percentage of single-page visits is your bounce rate. Essentially it is a user engagement signal to search engines. If your bounce rate is high, it tells Google that users are not willing to explore your website and will abandon it pretty quickly. Perhaps your content was irrelevant or low quality, or it simply didn’t deliver what visitors were looking for. Poor page load time, content, and navigation can all negatively affect your site’s bounce rate. 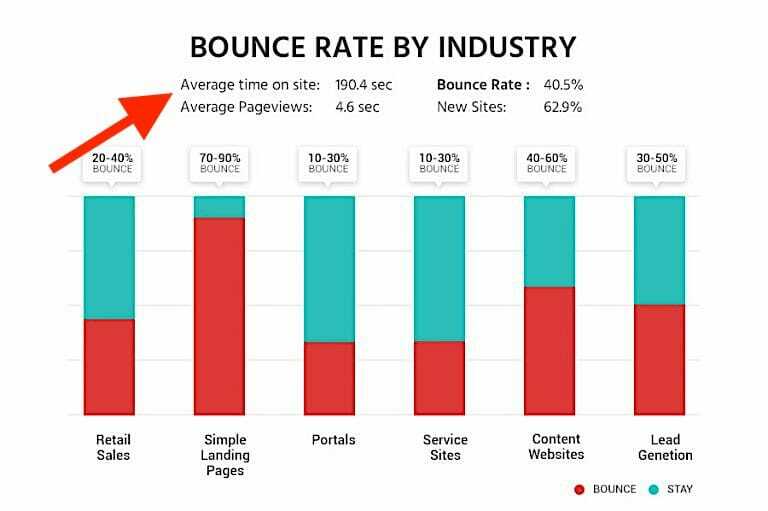 What is an average bounce rate? Average bounce rates can range from 35-65%. The average across a few top industries hovers around 40%. 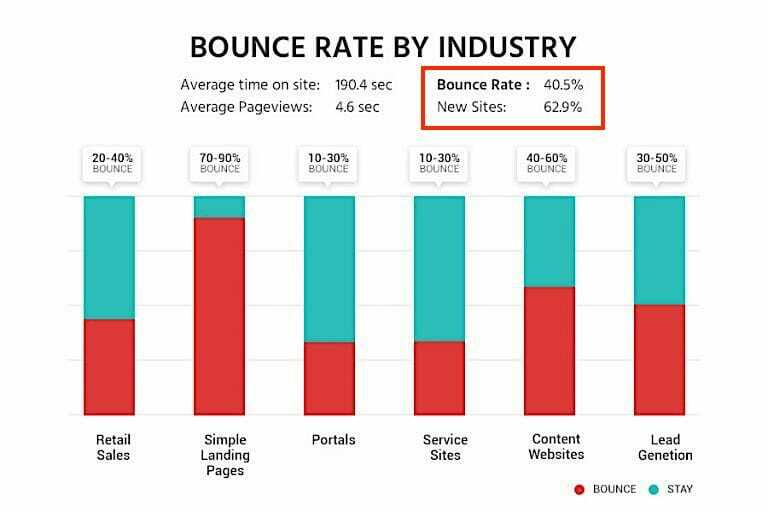 If you have a new site, expect your bounce rate to be a bit higher, around 62% on average. But generally, anything under 50% is a good indicator of user engagement. Deeper Linking: Linking to relevant pages within your content (pages per session example) can keep users engaged. More Relevant Pages: Develop supportive pages that can add value. For example, relevant product pages like guides, manuals, reviews, and case studies. Use Side Bars: Side bars are widgets you can employ that link to popular pages within your website. Engage Users Visually: Videos are a great way to improve user engagement. For instance, you can combine your content with a video on the same topic. Examine High Bounce Rate Pages: Identify pages with a high bounce rate and tweak them. 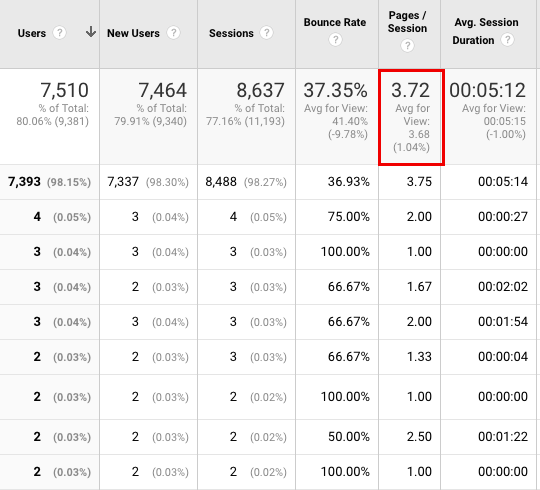 Using Google Analytics, you can easily identify pages with high bounce rates and improve them. By increasing time on site and pages per session, and at the same time decreasing bounce rate, you can easily increase your site’s rankings. With these analytics out of the way, it’s time to look at outside factors like how many referring domains your site has. 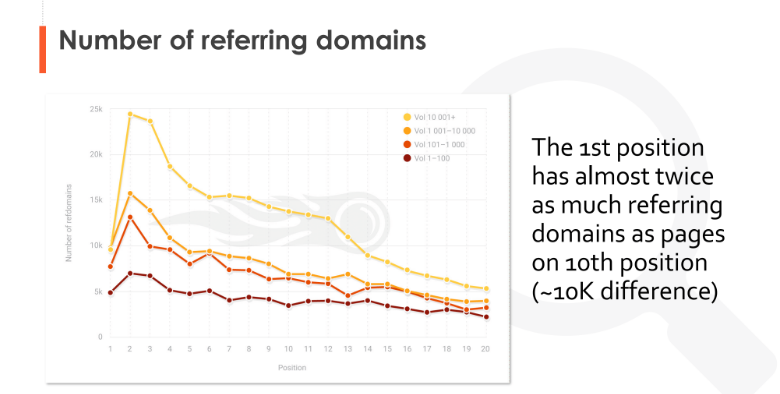 The number of referring domains that point to your site via backlinks continues to be an important ranking factor in 2019. For instance, the top link in Google’s search results has double the referring domains as the content in position 10. A referring domain is simply the number of websites that are essentially vouching for the quality of your site, the content, or the products and services you offer. You can have multiple backlinks from one referring domain. Ideally, you need a mixture of referring domains pointing to your site, including high- and medium-authority sites. It’s unnatural to have only authoritative sites pointing to yours, so the key here is to have both quantity and quality, but always ensuring that your backlink profile looks natural! Getting more referring domains works into your SEO link building strategy. One of the best ways to build your link portfolio is to create high-quality content that is shareable. 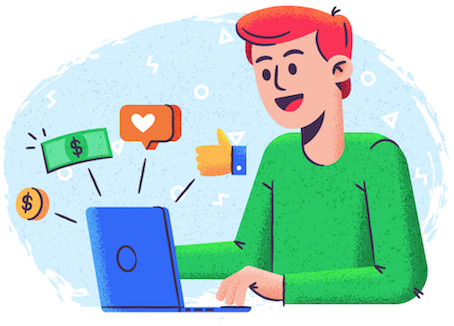 For websites that offer products and services, you can employ an influencer marketing campaign to grow your number of referring domains. Why? Influencers get more content shared! Blogger influencers can be great for this, especially if they write for high-quality publications. This leads us to the next big ranking factor in 2019: the amount of links in your link portfolio. 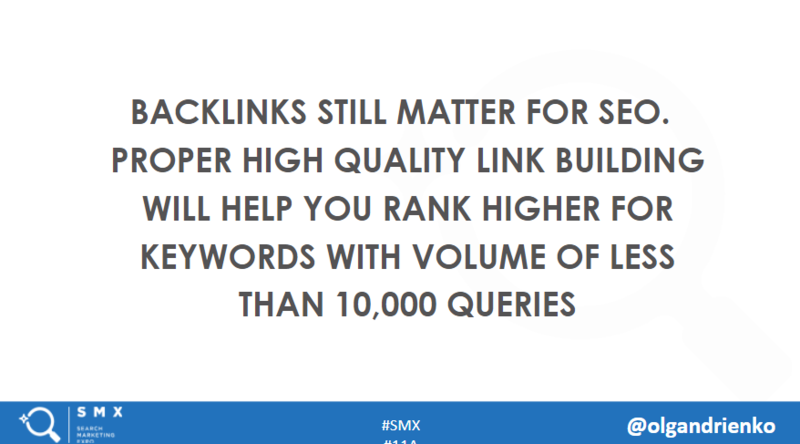 Not only do you need a high number of referring domains, you also need a large volume of backlinks. According to Olga Andrienko, backlinks are one of the most powerful ranking strategies. This was observed after analyzing the top 100 results for over 600,000 keywords. The quality of link sources is close behind. Do your due diligence when looking at potential backlinks, making sure the sites are authoritative and relevant. Backlinks are a vital part of any SEO strategy. They act as big ranking signals and they have traffic benefits as well, which is another important ranking factor for search engines. This is especially true for high-volume keywords. The importance of link building goes without saying, but actually netting more backlinks is where many site owners struggle. Broken Link Building: Using this strategy, you hunt down broken links in other sites’ content with the intent of replacing it with your own. You can use the Google Chrome plugin Check My Links to identify broken links and then send outreach emails pitching your link as a replacement. Find Relevant Resource Pages: One of the easiest ways to earn backlinks is to find relevant resource pages you can get your website listed on. You can find resource pages by typing in “Keyword” + “helpful resources” or “keyword”+ “useful links” into Google’s search bar. Identify the most relevant and send outreach emails. 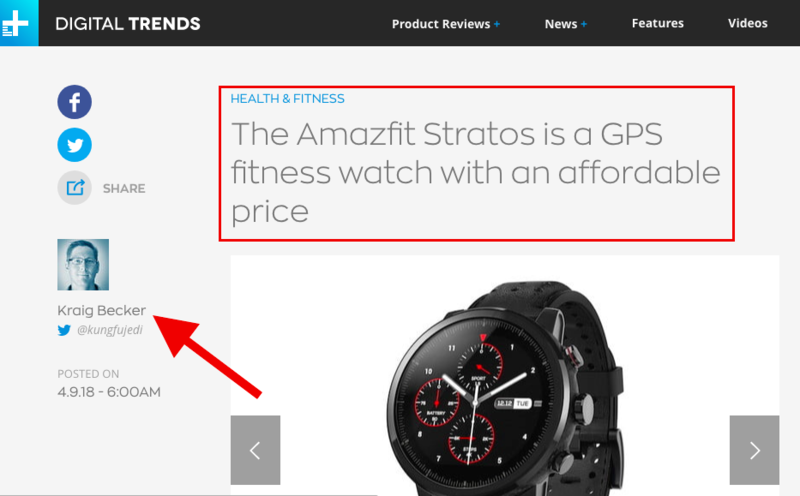 Brand Mentions: You may be surprised how many websites mention your brand without linking back to you. Using BuzzSumo, you can identify shares of your content and ask for a backlink. One of the best ways to earn more backlinks is to combine your link building strategy with your content marketing campaigns. By producing high-quality and highly shareable content, natural links simply come without effort. Developing quality content is essential to your link building efforts. Content is also an important ranking factor in 2019. In many ways, the ranking factors that matter the most in 2019 hinge on content development. From increasing direct traffic to increasing user interaction with your site, content is still king. Creating high-quality content is important, and there are a few requirements for powerful content that increases ranking. Content length is one! In fact, longer content ranks better. 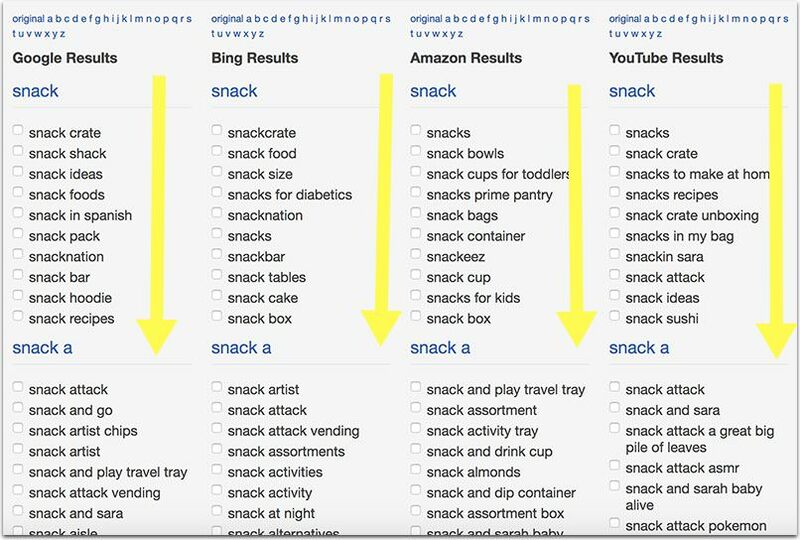 Another important ranking factor to consider when it comes to content is unordered lists. 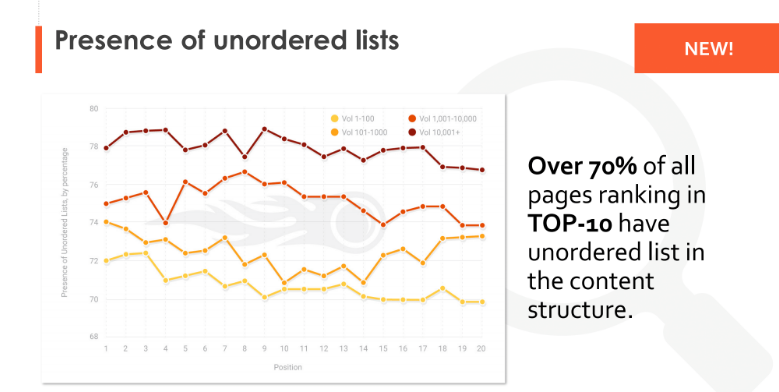 In fact, 70% of content in the top 10 Google positions use the power of unordered lists. Lastly, add an H1 tag to your content. Over 75% of pages with high volume keywords contain an H1 tag. Get the most out of your efforts by making your content lengthy, actionable, and engaging. By improving on the above top-ranking factors, you can serve up quality content, improve key analytics, boost traffic, and build a robust link portfolio. In many ways, by improving just one or two of these points, the others will also improve. Like many things about SEO, the correlation between ranking factors are indeed powerful. Marcela DeVivo is an SEO expert and online marketing entrepreneur who has been in the business since the beginning. Since starting her own SEO consulting firm in 1998, she has founded 4 separate companies and worked with major international brands and small businesses alike to create powerful, integrated marketing campaigns.